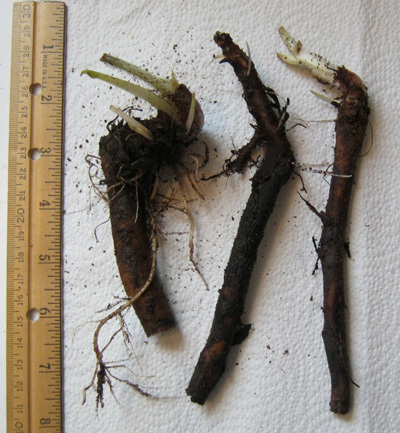 Comfrey Root Ordering: Living Roots and Seeds for sale. Organic. True/Common Comfrey Live Roots and Seeds. Russian Comfrey Bocking #4 & Bocking #14 Roots. Live roots, seeds. 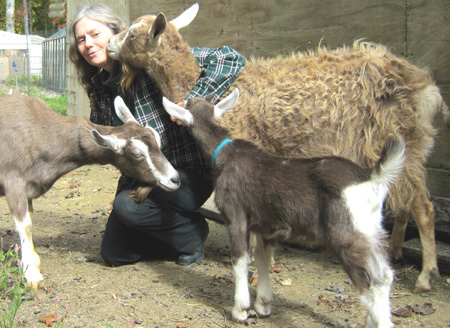 For feed, fertilizer, health. Shipped every Monday. Mail to USA only. Prices below. Organic Russian Bocking #14 comfrey root cuttings (Symphytum x uplandicum = Symphytum uplandica = Symphytum peregrinum) with purple flowers. 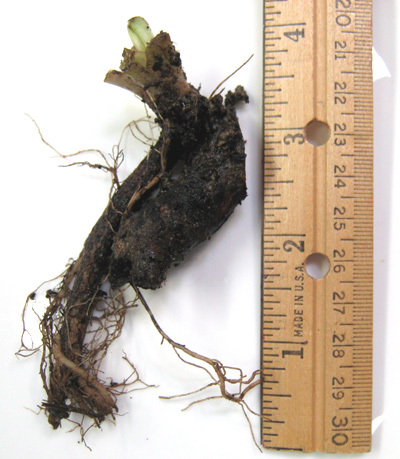 Roots are 4 to 6 inches long and about the size of a finger. If the root is thinner, you receive a longer piece. 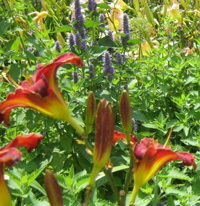 Plant horizontally in the ground about 2-3 inches deep. Little rootlets grow along the entire root. 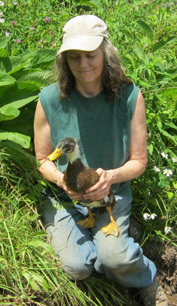 This is Comfrey #14. 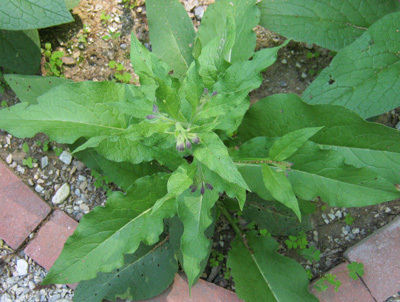 Comfrey #4 and #14 plants grow to the same size. Includes a flyer about growing comfrey. For more ways to pay, see bottom of page. $9.90 for one root cutting of Russian Comfrey Bocking #14. Shipped Monday. Shipping is $7 no matter how many comfrey roots you order. 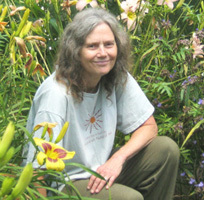 Your roots will be crown cuttings with leaves trimmed off or a root cutting with a bud that is ready to grow. 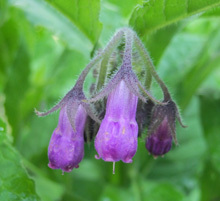 Organic True or Common Comfrey plants (Symphytum officinale var patens) with purple or purplish flowers. 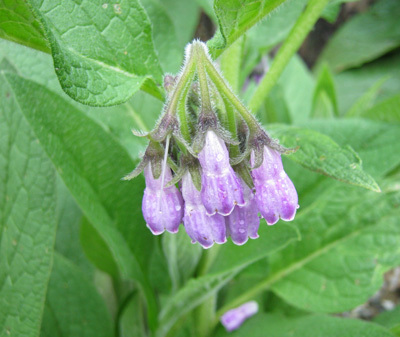 True (Common) Comfrey flowers come in different colors such as purple (various shades), red (bright pink), yellow, white, and light pink. 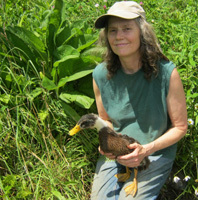 This is the original, heirloom, medicinal comfrey. 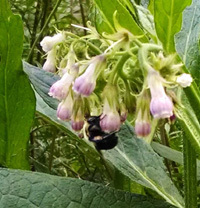 This photo is Russian Comfrey Bocking #4 on the left, and True Comfrey on the right with deep purple flowers. 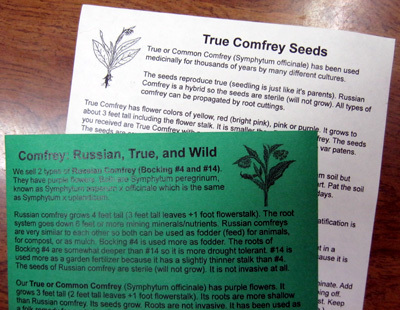 True Comfrey is about 2/3 the size of Russian Comfrey. The type I have for sale here is purple. Some are deep purple, others are more reddish purple. Occasionally there is a pink-purple. Which type of True Comfrey you get is random. I don't have the plants separated in our garden. Most are purple like the above photo. 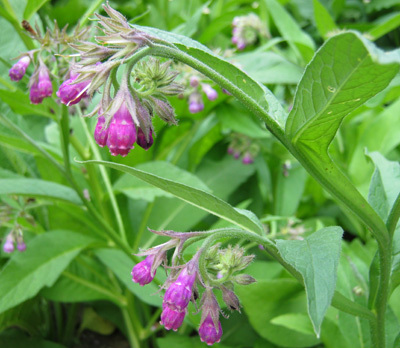 The photo to the left is the more reddish purple flower of True Comfrey. Then below with the bumble bee is the pinkish flower. The live roots are ready to grow. They are 4-5 inches long. Length depends upon thickness of root. It may or may not include a green growing top. Each root is different. Planting instructions included with your order. Common or True Comfrey- $15 a root. Shipped Monday. Shipping is $7 no matter how many comfrey roots you order. Your roots will be crown cuttings with leaves trimmed off or a root cutting with a bud that is ready to grow. 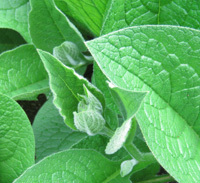 1 True/Common Comfrey Root + 30 Seeds= $24. Shipping is $7. 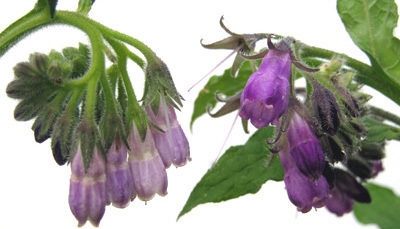 Organic True or Common Comfrey seeds (Symphytum officinale var patens) have purple flowers. 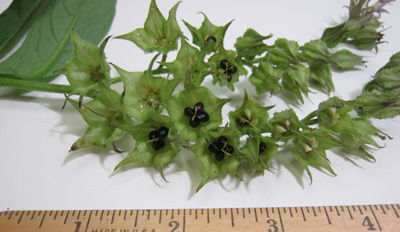 These seeds are open pollinated, not hybrid, not treated with chemicals, and not GMO. They are good, natural seeds. A flyer about how to germinate and grow seeds is included in your order. 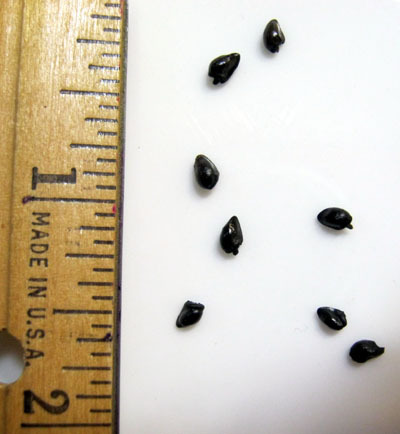 True / Common Comfrey Seed. Same shipping no matter how many seeds you order. For more ways to pay, see bottom of page. Comfrey seeds on flower stalk. 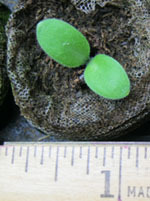 Right: A young seedling with ruler (1"). 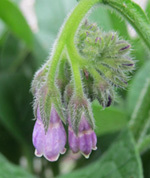 Common or True Comfrey Seeds with purple flowers (var patens). $112.00 for 2 teaspoons, about 520 seeds. $1.95 shipping. $58.50 for 1 teaspoon, about 260 seeds. $1.95 shipping. $31.90 for 1/2 teaspoon, about 130 seeds. $1.95 shipping. $17.95 for 60 seeds. $1.95 shipping. $9.95 for 30 seeds. $1.95 shipping. Organic Russian Bocking #4 comfrey root cuttings (Symphytum x uplandicum = Symphytum uplandica = Symphytum peregrinum) with purple flowers. 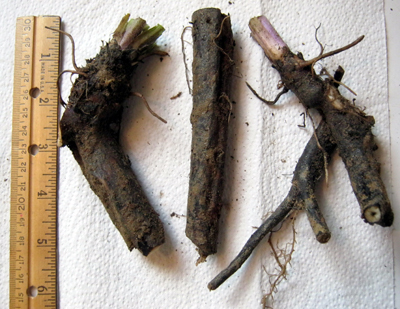 The roots are 3 to 4 inches long and about the size around of a finger. If the root is thinner, you receive a longer piece. 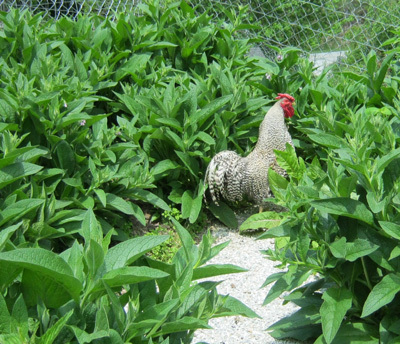 A Dominique rooster in a patch of Russian Comfrey No. 4. The plants will get wider and taller. The photo with the ruler shows what your root will look like. They are sprouted with small green leaves. $19.00 for one root cutting of Russian Comfrey Bocking #4. Shipped Monday. Shipping is $7 no matter how many comfrey roots you order. Your roots will be crown cuttings with leaves trimmed off or a root cutting with a bud that is ready to grow. 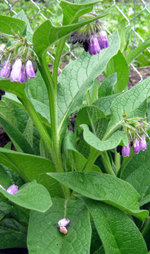 $7 shipping for live comfrey no matter how many you order. 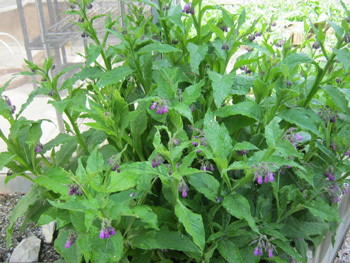 $1.95 shipping for comfrey seeds. Comfrey root orders go out every Monday. The weekly cutoff time is early Sunday morning. The Shopping cart may say "Health Treasures". 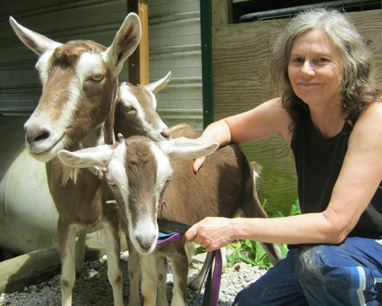 Sorry no pick up at the farm. 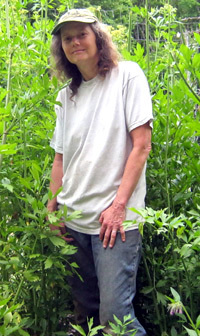 This photo is Nancy standing in front of lovage in late summer. 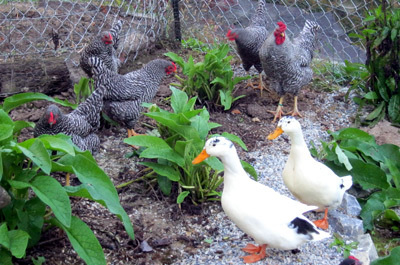 The next photo is Dominique chickens and Ancona ducks in comfrey. Those plants have been trimmed recently. They get much bigger.